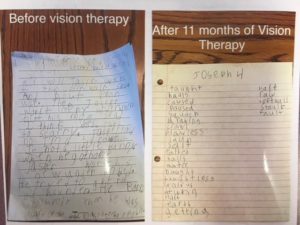 “Vision Therapy changed my son’s life. We have seen dramatic results this past year. My son struggled with periphery and fine and gross motor skills, which we didn’t realize were tied into his vision and primitive reflexes. His periphery is expanded; he is no longer seeing the world through straws, and consequently, he doesn’t fall down like he used to, and he can catch a ball better. His confidence in sports has skyrocketed, and he initiates playing sports now. He is less frustrated by tedious tasks and will take the time to complete them. Vision therapy has helped me a lot. Before VT, sports were hard. Now I can catch and throw better. Playing sports is easier now. I used to get headaches but now they don’t come at all. VT has helped my handwriting. It used to be sloppy and hard to do, but now it is easier. Sarah helped me increase my vision. She is very nice. I am thankful that VT is helping my eyes. “I feel that vision therapy has helped me in many ways. Here are some examples on how I have improved. First, I have noticed that in reading I’ve skipped over a few words. Now I noticed what I’ve skipped. I can also read a bit more smoothly as well. Another way it has helped me is in school, I can take notes easier because I can look at the board then back at my notes. I can also control my eye movements when they shift or focus. I can also do better in sports, too. I can hit targets better in karate. Finally, I can improve my confidence because I can work hard and not give up. I feel proud of myself for improving in lots of stuff I couldn’t do before. “Since Jacqueline started vision therapy last year, her reading comprehension has greatly improved. She is able to focus and concentrate on school work for longer periods of time. She also does not complain of headaches all the time anymore. Jacqueline is also less fidgety when sitting. Now she rarely mixes up numbers or letters when doing work. “When my daughter, Jacqueline, started vision therapy, I began to learn a lot about vision that I previously did not know. I realized that I was having problems of my own beyond my very nearsightedness. Since starting my own vision therapy journey, I have had my headaches almost completely disappear, my driving has improved, and I am able to enjoy reading for longer periods of time again without falling asleep. With my therapy as well we have been able to lower my contact prescription quite significantly, which is something I thought could never happen! “Landon has always been a great student who has tried very hard. Five or six years ago, we noticed that reading was becoming/remaining a struggle despite our efforts of assistance. At that time his younger brother was surpassing him in ability, despite his best effort. At that time we had him evaluated with Dr. Myers. He recommended therapy at that time but we put it off because of cost and time commitment. I truly thought with maybe more phonics development, one-on-one reading, increased reading time, etc. we would see more improvements. While he was still progressing, he was still taking a long time to read (on tests), or we were compensating by my reading aloud to him. “In November of 2016 I was in a car accident that left me with whiplash and a prolonged concussion, etc. When Preliminary Concussion Therapy did not clear up my bad headaches and vestibular issues, the doctor recommended me to Dr. Myers at Indiana Vision Development Center. Through the year of therapy there has been much improvement with my vision. I no longer have double vision. My right eye is tracking along with my left eye now. My reading has improved, as for much of the time after the car accident I avoided reading because of the headaches and visual disturbances. I can drive and ride in the car for longer periods than a year ago; I hope that continues to improve because I used to do the majority of driving on road trips. My concentration and cognitive abilities have improved so much in the last few months. After the accident, I felt shut off from my life because I was not able to follow conversations or be around noise or much busy activity. But now I feel more like myself than I have since that life-changing event in November of 2016.